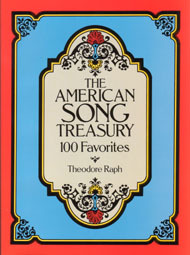 Sheet Music, lyrics, simple arrangements, and guitar chords for 100 songs popular from 1620 through 1958. Each song was selected for being the national hit of its time in the United States. Yes, according to Mr. Raph, "Greensleeves" was THE national hit in the United States in 1620 ! All of these songs are still well known today and are great for sing-alongs of all ages. PUBLIC DOMAIN STATUS: The publisher states on the back cover: "Because they're in the public domain, these tunes are also desirable for professional and commercial use (No permission or royalty payments necessary!)". This may not apply in countries outside of the United States where copyright protection may exist. We also include a copy of a letter from the publisher advising " . . .Although we would not want this statement construed as a warranty or guarantee, to the best of our knowledge this material is in the public domain. . ."